This piece is perfect for any Senior Living or Active Adult center. 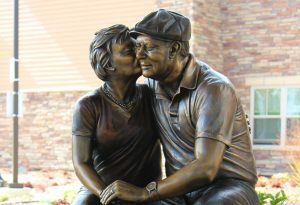 The inspiration for this piece was my grandparent’s love they had for each other, and I love being able to share it with people of all age groups, wherever I install it. Are you interested in your own “The Golden Years?” Contact me at abweishel@gmail.com or visit my website for more information. I have been working on a custom architectural piece for the last seven months. I’m recreating a bronze wall that was first installed in the 1900s. This original piece has many historical references, one of the most important being the connection to the assignation of President Kennedy in Dallas in 1963. Lee Harvey Oswald was shot in the basement of the building that this new piece is being designed for. This project is both exciting and challenging for me; I’m very eager to pursue more design pieces and architectural elements of art, while still overcoming the challenges of modern day code and enforcement. Building walls and elevators of bronze is a rewarding feat, due to the fact that I can only sculpt so much and so deep while still remaining in modern building code. There are many moving parts that I have to think about during every step. Even though today’s technology propels us towards the future and solves many problems, it’s not without limitations. Adding bronze to an elevator and wall is heavy and I am working tirelessly to meet code compliance. I am excited to continue working on this piece, and can’t wait to show you the final work. Guadalupe is an over-life-size 9.5 foot bronze sculpture that is in the final steps of reaching her completion. When finished, she will be 1000 pounds and have enclosed structural components that will be able to support all of her weight as well as environmental factors, such as strong winds. This piece was sculpted to honor the original Guadalupe, within one millimeter of the original painting. Currently, she is in the “metal-chasing” stage of the artistic process, where skilled workers weld the pieces of the sculpture back together to make it appear as though the sculpture was never in pieces before. This is also an interesting and important part of the final stages of completion because texture and detail are added back to the piece, as if it was never welded before. This is crucial to maintaining the artistic expression and integrity of the sculpture as I created it in the beginning stages. After the laborious process of metal chasing, she will go to coloring. I chose to color her with the original palette of the painting. It is an exciting time when sculptures reach this phase and they begin to come to life. The Captain is fully sculpted in clay! 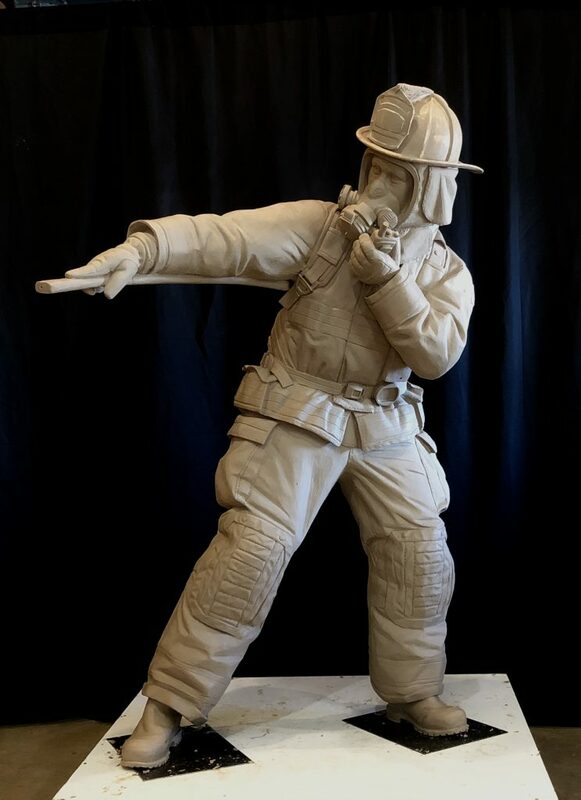 He will end up with the other firefighters I sculpted for the Nevada State Firefighter Memorial in Carson City, Nevada. The Captain will head to mold making next, where a mold maker cuts the sculpture into pieces to make a mold of the figure. He will end up at the bronze phase in the next two weeks. You can also see Firefighter #1 in pieces, ready to be welded together. This process can take anywhere from 5 to 80 hours of time. Texture and detail will be added back to the sculpture once he reaches the metal chasing stage. I’m excited to be able to show all the firefighters in action, once this memorial is complete. Here in Wyoming, we have been bracing some frigid cold. 80 mile per hour wild gusts and a low of -11 degrees on New Year’s Day, you can say that we have been bundling up! Luckily, someone thought of their friends and placed a blanket around the couple in “The Golden Years” to keep them warm during our blistering cold nights. I hope this reminds you to always lend a helping hand (or blanket!) to a neighbor, as well as hold dear the relationships in your life that make it special.